Southern California, grabbed 3 golf clubs, stuffed them down his pants, and tried to walk out without paying. 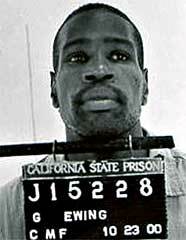 He was (obviously) caught, arrested and thrown in jail for life thanks to California’s “Three Strikes” policy. He eventually died in prison, twenty seven years later at the age of 49, from pneumonia and colon cancer. Now, can you name the American corporation which, like Ewing, broke the law, however, in their case, not one person spent even a day in prison? Their crimes involved many, many millions of dollars spent on bribery and coercion done over the course of nearly two decades and spanning at least 9 countries, involving the US State Department, British royalty, countless spies and couriers (some identified and some not), diplomats, both foreign and domestic, tax evasion, and money laundering. HINT: This American company has done what a LOT of US companies have been nailed for in recent years, although this fossil fuel company did it BIG, earning themselves the dubious distinction of getting the largest financial penalty of its time. The amount has since been surpassed, but this one made headlines. The Securities and Exchange Commission (SEC) and the Department of Justice enforce this 1977 provision of the Dodd-Frank Wall Street Reform and Protection Act. Previous How much oil and gas drilling is going on in YOUR state? You are SO right, Scribblerator. I need to wrap up the (only) contest without a winner. The horrible company was Baker Hughes and they broke laws abroad. I’ll sum this up tomorrow. And thank you for bringing it up. I keep thinking that I need to write up this information. Happy New Year! Did you see that I finally wrote up the Baker Hughes thing (in a separate post)? Sorry it took so long, scribblerator. Not them, Heather…remember that if you guess, you have to give the law/laws they broke or the name of the case, please. Keep trying, though! No, but they seem like an obvious “fit,” right, Scribblerator? And please, if you do guess again, put which law or laws were broken. Thanks for your comment!